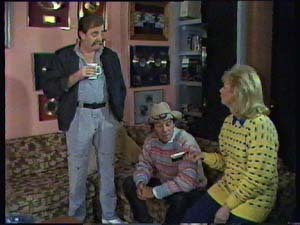 Scott and Mike find out that their appointment with Molly Meldrum was a setup. Scott and Mike apologise for wasting Molly Meldrum's time and start to slink off. Molly can see that they've spent a lot of time working on the tape, so agrees to take their tape to listen to it. The secretary warns them that they get hundreds of demo tapes, so they shouldn't get their hopes up. When Scott and Mike have gone, the secretary calls Molly an old softie(!) He tells her to put the tape on now - he's got a couple of minutes to spare, and you never know, it could be a hit. Charlene and Clive are waiting for Scott and Mike to come back. When the get back they explain what's happened. 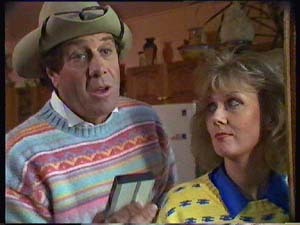 Clive and Charlene are shocked to hear they were set up. CLIVE: Who would do that? Mike tells Clive that Molly said he'd listen to the tape, but they're not getting their hopes up. Molly has listened to the song and thinks it's definitely got something. He says that Brian Hanson is coming over this morning and he'll play it for him. MOLLY: Whoever set those guys up, could just well be doing them a favour. Mike and Scott are still gutted about what happened at Molly Meldrum's house. Sue sees them walk past and takes the opportunity to torment them. They realise she was the one who set them up. Sue laughs her head off and tells them they asked for it. Charlene tries to hit Sue, but Scott and Mike hold her back - they tell her to remember what happened when Jane hit her. The story has got around and lots of schoolkids are laughing at Scott and Mike. 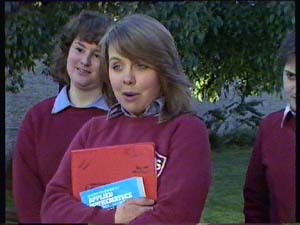 Charlene says that they have to get Sue back somehow, but Scott and Mike tell her to forget it - they just want to pass their exams now. Scott says he doesn't want to be famous anyway - it's just a load of hype and it breaks up friendships too. They wander off to class. Brian Hanson is playing Molly some demo tapes. Molly plays Scott and Mike's tape for him after some persuasion. CLIVE: How should I know? You married her! Des goes on to tell Clive that he's read that some people try to have a family for years without success. He tells Clive quietly that sometimes it's the bloke's fault and he's heard there are tests a bloke can have done! Clive thinks it's a bit early to be having tests and tells Des to relax and be patient. Scott, Mike and Charlene have cheered up - someone threw a dissected frog at her and now she stinks. Her two friends turn away from her and she's left on her own. Charlene is telling Lucy about Sue and the dissected frog and Lucy thinks it served her right. Charlene sits down with Scott to study while Lucy answers the phone. 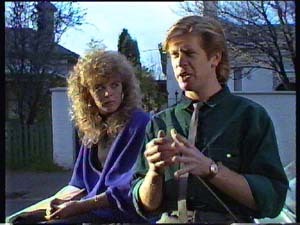 It's Molly Meldrum's secretary, much to Scott's surprise. 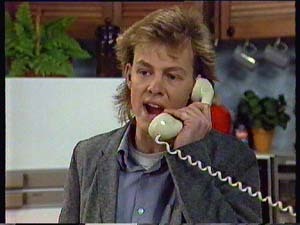 He thinks it's Sue again, so he picks up the phone. SCOTT: (into the phone) Listen here! I've had enough so just rack off! MOLLY MELDRUM'S SECRETARY: (putting down the phone) I don't believe it! He told me to rack off! 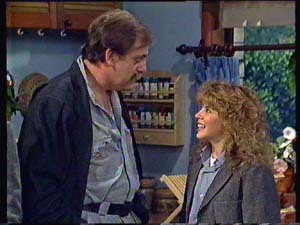 Des comes in and gives Daphne a pash. Daphne gives Des a present that his mum left for him. It turns out to be a love potion! Des laughs and wonders if it works! Daphne says that they don't need a love potion. Des secretely puts the love potion in his pocket! 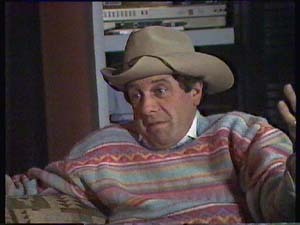 Clive and Mike tell Des about what happened at Molly Meldrum's that morning. Mike says maybe it's better to have a secure job where you get paid every week instead of being a popstar. Des says that you can't always play things safe. He looks thoughtful and fingers the love potion! Charlene is having trouble with her maths homework while Scott is still fuming over what Sue did. Daphne tells Des that she talked to Clive about having children, and Des admits that he did the same thing! They agree they're both being a bit over-anxious, these things just take time. Daphne says it's a bit like souffle - get all the ingredients and put the oven at the right temperature! 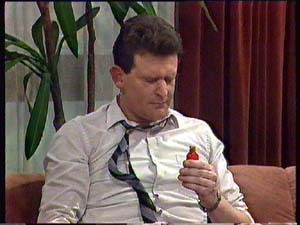 Des starts giving Des a massage and finds the love potion in his pocket! She laughs. DAPHNE: Forget all the mumbo-jumbo and think...souffle. She gets up to go to take a bath. When Daphne has gone, Des uncorks the love potion, sniffs it and coughs! Charlene and Scott are having a coffee when there's a knock at the door. Lucy answers it to Brian Hanson! She recognises him and gasps in awe. She shouts to Scott. Lucy runs through the kitchen saying that Brian Hanson is there to see Scott but he won't believe her. But when Brian Hanson comes through to the kitchen Scott realises it's true. Scott is really pleased and asks when he and Mike can start recording! Brian says it was a great first effort and the song has a lot going for it - like the great backing vocals for example. 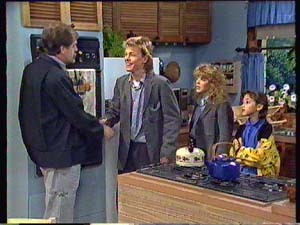 He tells Charlene that she's got a great voice with tons of potential. 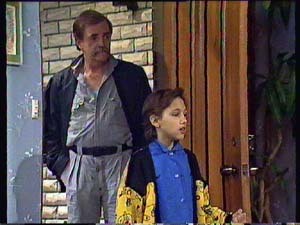 In fact, he's come to see if Charlene would like to try singing in a real studio. Thanks to Scott, he thinks they may have struck gold with Charlene! CHARLENE: Me? You want me? CHARLENE: I could be a singer?! CHARLENE: I don't believe it!